A small group of local activists had been keeping a vigil for over 3 years outside one of Ancoats’s most iconic ruins: the old Ancoats Hospital building, constructed in 1875 as a replacement for the earlier dispensary, opened in 1828. The Ancoats Dispensary Trust – the organisation who keeps the vigil – was formed in 2011 as ‘a reactionary movement in opposition to the proposed demolition’ of the Grade II listed hospital building by Urban Splash, who had purchased the building (apparently for just £1) in the 1990s but had been unable to find an alternative use for the building, despite the company’s chair and co-founder Tom Bloxham declaring in 2001 that ‘if we don’t deliver of this one, we’ll never work in this city again.’ Having initially worked with the North West Development Agency (NWDA) in renovating the Dispensary into apartments, erecting scaffoldings and removing the existing roof, the abolition of the NWDA in 2010 by the new coalition government resulted in Urban Splash ‘mothballing’ the building and applying to the City Council for a demolition order. With the destruction of the building seemingly imminent, a grassroots campaign was begun that has put forward an alternative proposal to turn the building into a community space. 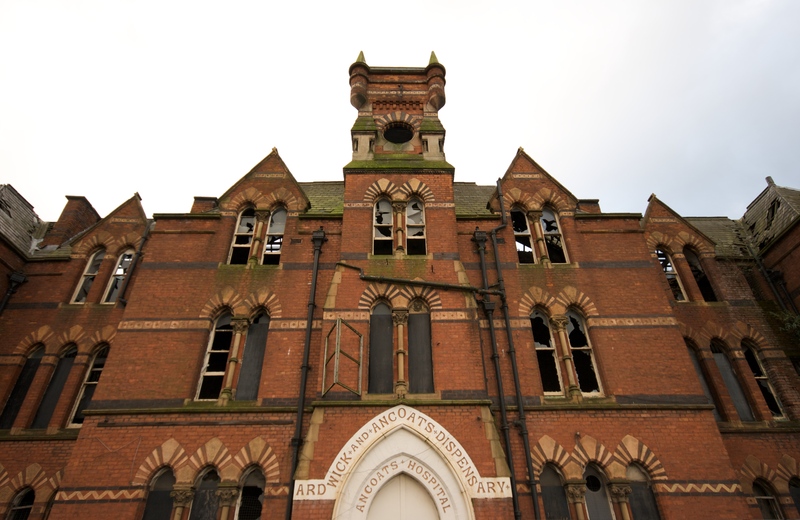 As the Ancoats Dispensary Trust has argued, the campaign for the Dispensary to returned to ‘common use’ reflects the history of the building as a place of healing within the larger Ancoats area. As the campaign chair, Linda Carver, has argued, the motivation for returning this ruin to the community grew out of widespread dissatisfaction with both Manchester City Council and Urban Splash’s policy of turning the New Islington area of Ancoats into a mainly privately owned site with only small concessions to social housing. 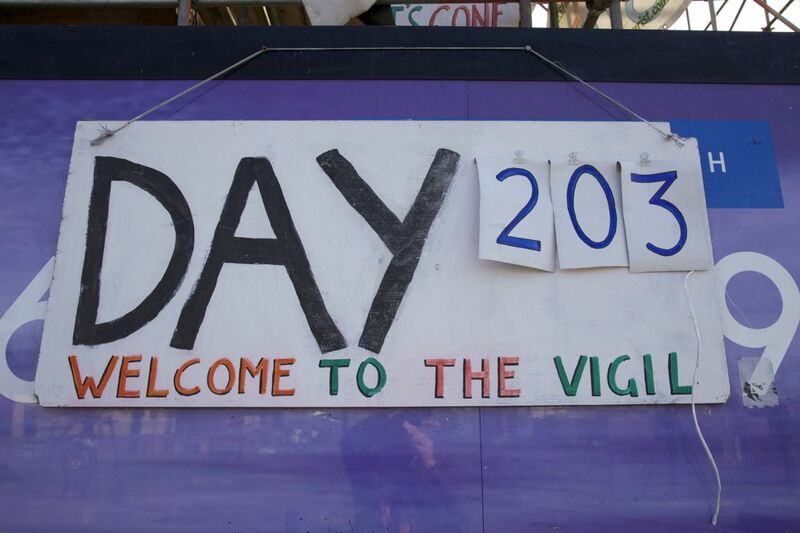 Indeed, in my own visits to the Dispensary in March 2014, I encountered the same feeling amongst those volunteers who maintained the vigil for three hours in the afternoon every weekday of the year. With a host of makeshift placards and posters now obscuring Urban Splash’s now ironic images of what the Dispensary might have looked like if converted into privately-owned apartments, the vigil has created and occupied its own space of resistance outside the ruined building, re-appropriating it as a site of political protest. That the vigil has continued unbroken for so long is a powerful testament to the tenacity of dedication of a small group of local citizens to what seems a thankless task (the campaign has already been refused Heritage Lottery Funding twice).What all of the volunteers I spoke with had in common was a history of displacement by regeneration programmes in the East Manchester area: for example, Chris was moved out of Ancoats by the local authority after his rent was raised by Adacdus Housing (the association who used to manage the housing in Ancoats on behalf of the City Council); Jackie had lived in Ancoats for 42 years before her block of flats was scheduled for demolition and she was relocated to Openshaw; while Patrick lived in the neighbouring area of Clayton, but nevertheless felt strong affinities with displaced Ancoats’ residents. All shared a common sense of anger towards both Urban Splash and Manchester City Council regarding the regeneration of the New Islington site. Both Chris and Patrick regarded the new apartments along the Ashton Canal (including the Chips Building, designed by Wil Alsop) as being only for wealthy buyers, while the waste ground that lay in between the Dispensary and the Rochdale Canal was an ‘insult’ to the Ancoats community because it was now fenced-off privately owned land that had been taken away from the existing community. 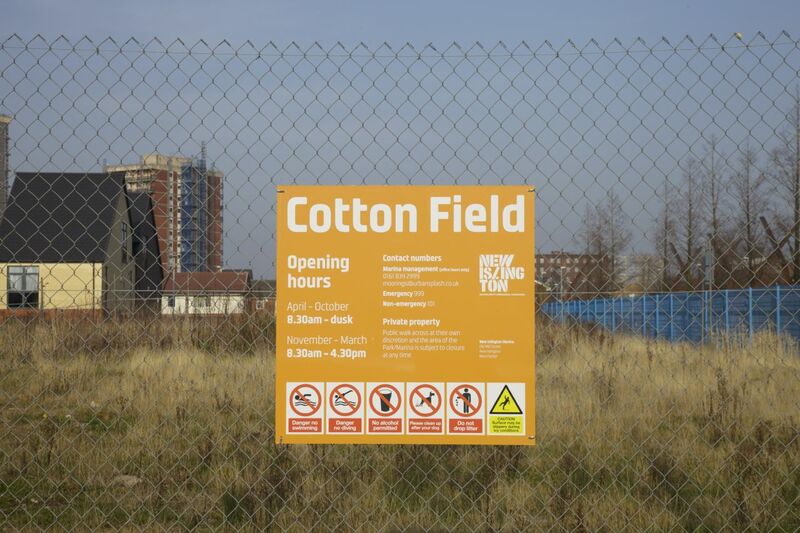 ‘Cotton Field’, the privately owned land that used to be occupied by social housing (the Cardroom Estate). 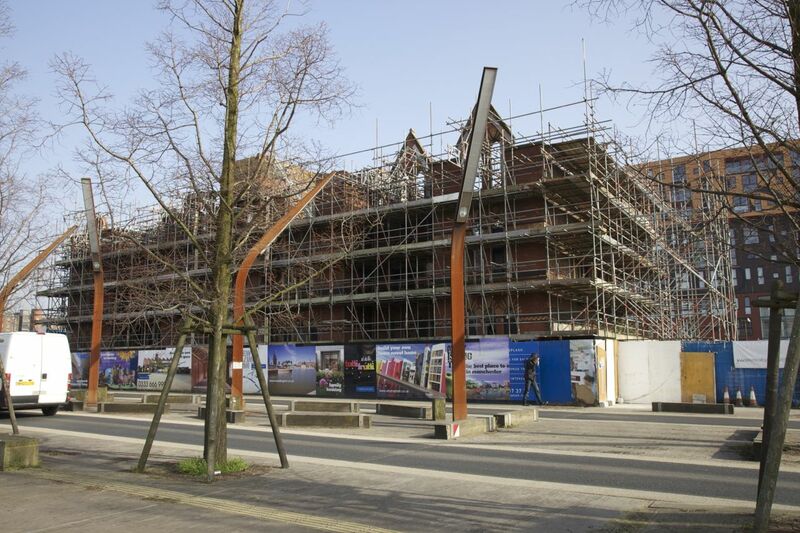 The campaign to save the Ancoats Dispensary has seized on a ruined building and reappropriated as a political weapon against the dominant and powerful forces of urban regeneration in the area. 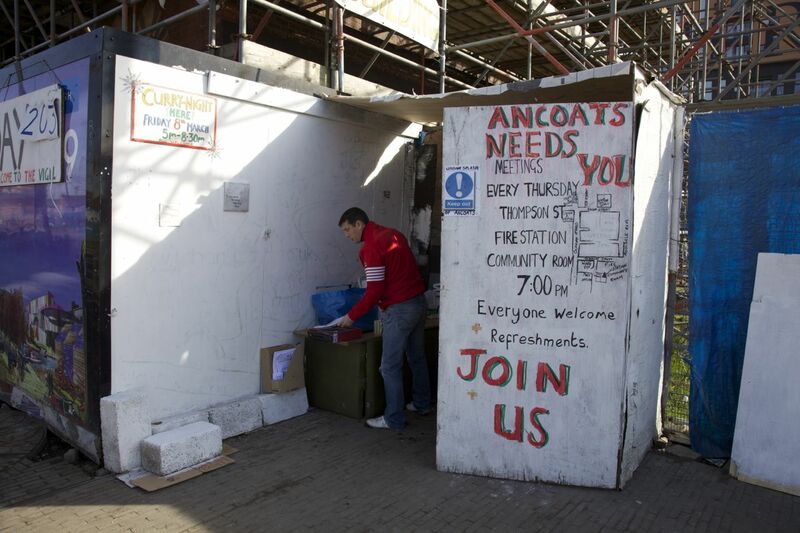 Although the outcome of the campaign is far from certain, it demonstrates how a local community (and one further afield) can galvanise itself around a ruin in order to make its voice heard and to articulate alternative futures. As Patrick explained to me, the Ancoats Dispensary is not just viewed as a convenient rallying point for long-standing resentments to be expressed (although it is partly that); rather it is a building that has a long history of being rooted in and serving the needs of the local community. From 1828 until 1996, the building was the local hospital, with additional buildings being added as needed. When the hospital was threatened with closure in 1987 by the then Conservative government, local residents from the Cardroom Estate staged a sit-in protest which resulted in the building’s continued use as a community clinic until 1996. The subsequent decline and demolition of most of the hospital buildings bar the Dispensary has undoubtedly fueled the anger felt towards the City Council. As Patrick stated, winning the money necessary for restoring the Dispensary will not only provide an enormous boost to a disenfranchised community, but also a heterogeneous space that will genuinely answer to the desires and needs of that community. In short, this ruined building has been transformed from an example of architectural failure to a focal point for emancipatory desire. Best of luck to the volunteers’ campaign.